Free Shipping. The Apex V753 Women's Sierra Trail Runner Trail Runner features a flexible strobble construction for forefoot flexibility, an abrasion resistant SmartMask™ Nylon upper material, and a durable "Rough Stuff" tip for walking on uneven terrain. The molded plastic footbridge with a medial support pod incorporates front to back rear foot control and a slip resistant outsole offers floating independent suspension. The Aetrex™ V753 Voyage Runner was designed to provide the ultimate stability and shock attenuation needed during hi-impact activities. 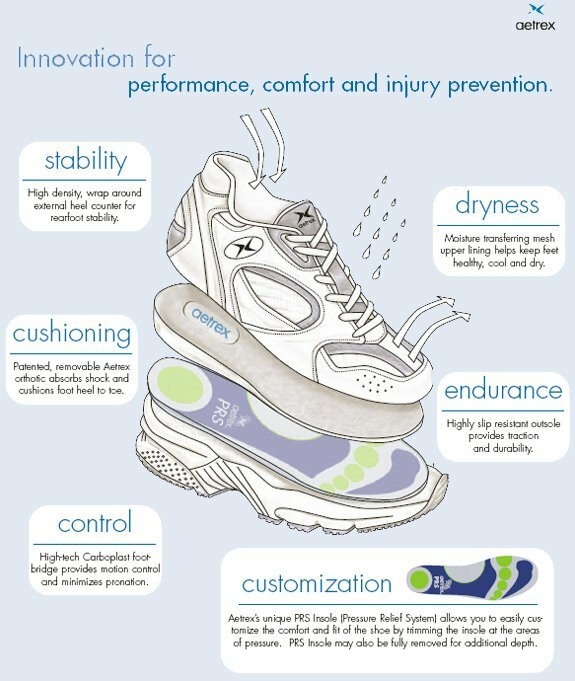 These technologically advanced athletic shoes come with patented, removable Orthotics and PRS (Pressure Relief System) Insoles for customization of fit and comfort.The Voyage outsole features strategically placed pods for floating independent suspension and shock attenuation. The unique Voyage last is semistraight to fit many foot types and provides a comfortable, snug heel fit for stability. Features slip lasted construction for forefoot flexibility, biomechanically engineered multi-density midsoles for medial support and stability, and a molded external heel counter for rearfoot control.The Voyage collection features moisture wicking open-air layered mesh linings to keep the foot healthy, cool and dry.All Voyage materials are light-weight, soft and provide unmatched comfort. -Abrasion resistant SmartMask™ Nylon upper. -Removable ThermoSKY EVA PRS (Pressure Relief System). -Total Removable Depth: .25 inch. -Keep feet healthy, cool, and dry. -Men’s companion shoe also available. -Upper - Synthetic leather and abrasion resistant Nylon. -Two-tone Grey shoe with Periwinkle Accents. -2 Removable Inserts - 1/4 inch total depth. -Available Widths per size: M(B/C), W(D/E), XW(2E/3E). I have a lot of trouble finding shoes that are wide enough. This pair was perfect. Comfortable enough from the first day to wear for long periods. I bought them for walking on a trip I am taking to Europe. Have owned a pair of the women's V751 (brown) and used them for hiking for a couple of years and have worn the tread down. These are the same shoe only in gray. I have found them to be true to size. Not many women's hiking boots come in my size-11B-and fit comfortably with socks. These do. I also really like the toe space. Very comfortable. One con, the insert that came with the shoe did not have sufficient arch support for my flat feet, so I have put in arch support inserts that I have purchased elsewhere. Advantages: True to size. Roomy enough for medium weight socks. Nice size toe box--toes can move freely, but foot doesn't slip around. Feel comfortable after wearing for hours. 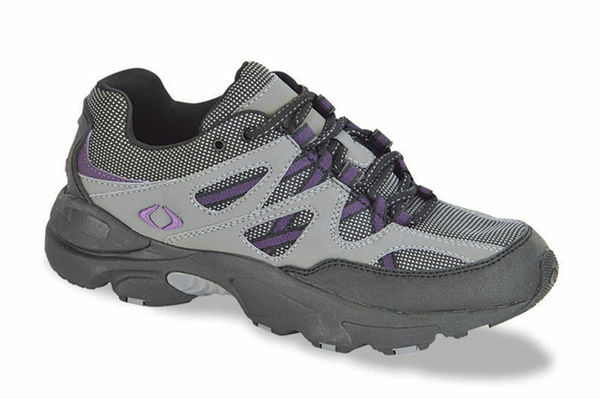 Good for hiking rough terrain with lots of rocks. Light weight--not a heavy shoe. Disadvantages: Does not have good arch support for flat feet--but can remove inner sole and put in own arch supports. Shoe laces do not slide easily making it difficult to loosen laces in order to put on and to take off shoes. Disadvantages: Run a little big, price a little high.